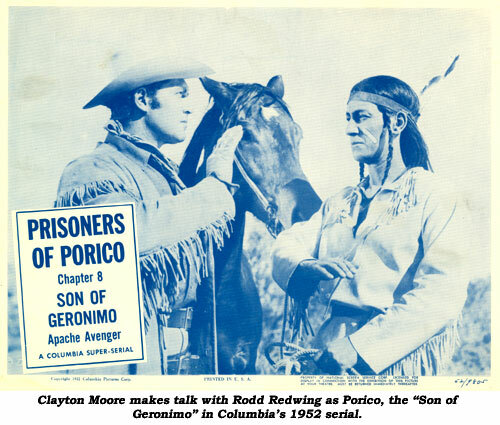 Full-blooded Chickasaw Indian stuntman/actor/technical advisor as well as knife and gun expert, Roderick (or Roderic) “Rodd” Redwing, born 8/24/04 in New York, taught paleface actors how to be proficient with firearms for over 30 years in Hollywood. Although known primarily for his gun expertise, Rodd has acted and done stunts in over 300 feature films and countless television shows. His father, Ulysses Redwing, was a stage actor. Rodd, while pondering an offer to teach history at a Wheeling, WV, high school (after gaining his bachelor’s degree at N.Y. University), accepted a role in the stage play “The Bad Man”. With the pay at $125 a week and this kind of money (in the ‘20s) being shelled out to actors, Rodd knew immediately where his future lay. Renown director Cecil B. DeMille was instrumental in bringing Rodd to Hollywood for the part of Lupe Velez’ brother in “The Squaw Man” (‘31). Rodd’s rep with a gun began on Howard Hughes’ production of “The Outlaw” (‘43) when Rodd was enlisted to coach actor Jack Buetel. 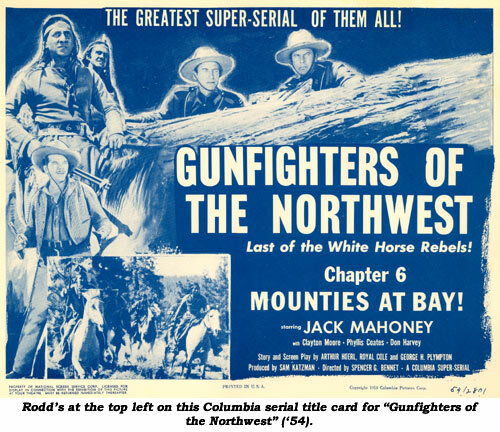 Although there were hundreds of westerns being filmed each year in Hollywood, surprisingly there were very few gun experts around, so it was not long before Rodd was much in demand. The list of actors he instructed in the art of fast draw and gun handling are indeed impressive, including Richard Widmark, Charlton Heston, Don Murray, Jerry Lewis, Anthony Quinn, Glenn Ford, Alan Ladd, Ronald Reagan, Dean Martin, Fred MacMurray, Mel Ferrer and Clayton Moore to name just a few pupils. 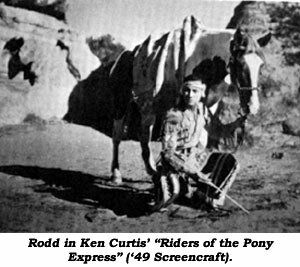 Not content at just fast draw, Rodd often was cast in acting roles or did stunts in such films as “Daredevils of the West” serial, “Sonora Stagecoach”, “Frontier Fury”, “Last Round-Up”, “Shane”, “War-lock”, “Apache Chief”, “Little Big Horn”, “Buffalo Bill in Tomahawk Territory”, “Pathfinder”, “Winning of the West”, “Copper Sky”, “Sergeants 3”, “Johnny Reno”, “El Dorado”, “When The Redskins Rode”, “Duel In the Sun”, “High Noon”, “Vera Cruz” and TVers like “Cisco Kid”, “Annie Oakley”, “Kit Carson”, “Buffalo Bill Jr.”, “Wagon Train”, “Custer” and especially “Wyatt Earp” in the semi-regular role of Mr. Brother. While on the set of “Gunga Din” in Lone Pine, Rodd was asked by director George Stevens if he could “Whip these guys into shape.” Being also a military expert, Rodd took on the task of training 3,000 Hindus, Ghurkas and East Indians the military drills of their own nations. The scenes choreographed by Rodd in “Gunga Din” are indeed impressive. 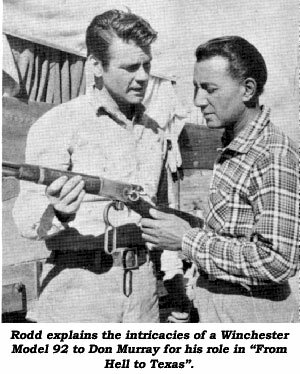 Rodd could also throw a knife faster than a man could draw a gun, demonstrating that ability on a special gathering of cowboys on “Wide Wide World: The Westerns” in ‘58. According to stuntman Whitey Hughes, Rodd kept a “day-job” for years “loading blanks at Stembridge Arms, a gun/ammo rental outfit on the Paramount lot.” I worked with Rodd quite a few times in my career and while we were on location at Bishop, CA, for “Nevada Smith” (Rodd was instructing Steve McQueen), I took a few lessons from the master. Sadly, Rodd passed away at only 66 on May 30, 1971, of a heart attack. But his scenes of actors showing their prowess with a gun (Burt Lancaster in “Vera Cruz” for example) enhanced many a classic western. Rodd’s stunt performances and his acting were a big part of hundreds of classic westerns. But his gun and knife wizardry is hard to top. Thanks, Rodd, for your input into these films we love so much.